The first and only paper in North America that covers transportation in Russian. 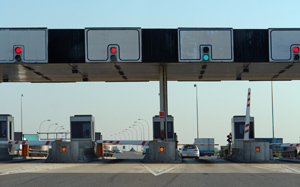 The American Trucking Associations (ATA) supports the “Freedom from Tolls Act,” which was introduced by Sen. Kay Bailey Hutchison (R-Texas) and would limit the spread of tolling on federal highways. The bill (S.1115) would prohibit states, private entities and private-public partnerships from adding tolls on existing federal highways, bridges or tunnels built with federal funding. Referred to the Senate Environment and Public Works Committee, the legislation does not prohibit tolls on new construction, and also exempts the conversion of HOV lanes to toll lanes from the prohibition. “ATA supports the continued reliance on fuel taxes as the primary means of funding much needed strategic investments in highway freight transportation,” said Graves. “The trucking industry has long opposed additional tolling on any existing highways or roads because collecting fuel taxes costs far less than any other proposed alternatives, making it the most efficient way to fund highway projects,” said Graves. In 2007, Sen. Hutchison successfully passed legislation that prohibits the tolling of existing federal highways built with taxpayer dollars in Texas. The Senate extended this prohibition through Sept. 30, 2009. Sen. Hutchison has been working to prohibit this form of double taxation since 2005, when she introduced an amendment to the Senate version of the Safe, Accountable, Flexible and Efficient Transportation Equity Act: a Legacy for Users (SAFETEA-LU) which sought to limit tolling of Interstate Highways. Tel: 416.500.5950 • E-mail: info@dorogaroad.com	 © 2007-2019 DorogaRoad.com. All rights reserved.